It would appear rhythm games still have a little life left in them. A fair bit of life given how well newcomers like Thumper or even old favorites like Rez still find a way to remind us of their charm, not to mention the potential height of their addictive nature. Whether it’s keeping up with the flow of the music or timing one’s shot when eyeing up a screen full of foes, Mad Fellows aim to fuse both of these rather enjoyable concepts into one all around package with their own take on the genre in Aaero. A similarly on-rails shooter/flyer hybrid of sorts that doesn’t lend itself too strongly in either direction but instead chooses to find a happy medium in-between the two — maintaining a careful balance of either gameplay mechanic while at the same time finding a way to hop between the two across the assortment of brief three-to-four minute tracks/levels on offer. At least, that’s the intention when looking at the game on paper. 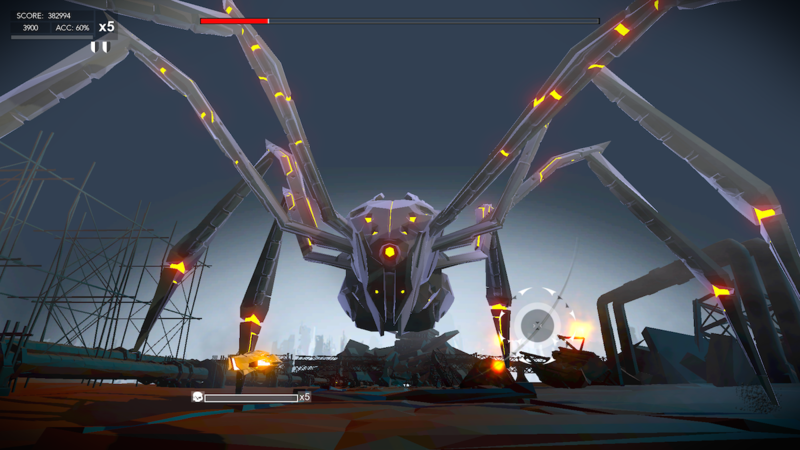 When it comes to its eventual execution, Aaero does at the very least manage to maintain a constant switch between its analog stick-dictated segments — requiring you to guide your trustee ship along a twisting, curving stream of light — and the latter shooter-focused sections that have you use the secondary right stick to aim at enemies. Along with, for both sections, any degree of hostility or danger that could disrupt your gradual build-up of points, be it obstructions within its many tunnel segments or the bullets enemies inevitably fire back as a means to deplete the spare lives you start off with. Sadly, as far as both its technical performance and amount of content offered goes, Aaero falls short as its fellow rhythm-based brethren. A game that should be remembered for its easy accessibility ending up better remembered for its frequent, unpredictable frame-rate issues on PC and a soundtrack that, while can’t be faulted for promoting certain pockets of electronic dance music — specifically that within the sub-genres of dubstep notably — tends to keep within this safe confine with very little notable variety, musically or in terms of the way levels themselves are structured by accompaniment. 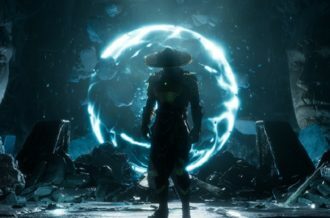 Regarding the former, when it’s apparent that the issue with the game freezing for seconds at a time, even as the level’s natural progression and music keeps going upon such an issue — ultimately cheating you out of a good run of a score or having you fly straight into the path of an oncoming obstruction or enemy bullet — feels more like “when” not “if”, it ends up pulling any and all casual immersion or enjoyment one can garner from a game that often rewards careful controls and punishes, moreso, a lack of when in later levels. 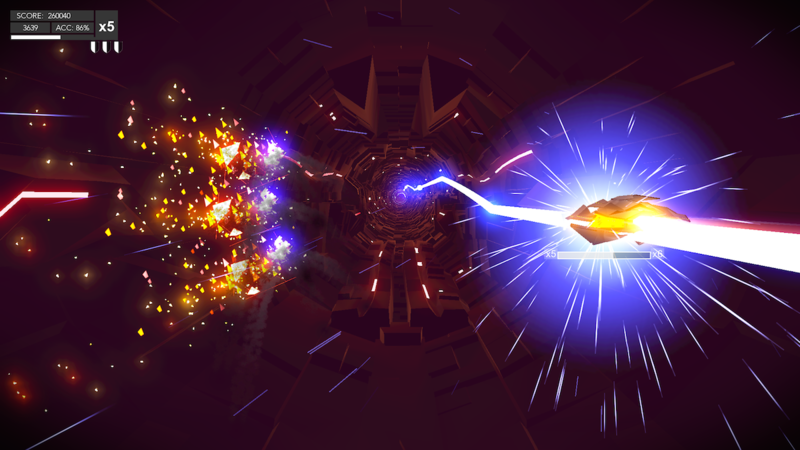 Should the frame-rate and natural flow of its levels remain untouched by technical bugs, for those expecting the game to, like Rez, offer some manner of gradual evolution or build-up towards a grand climax may well come away disappointed given how Aaero‘s semi-abstract art-style (and fairly neon/bloom-coated indulgence) remains relatively unchanged despite the shake-up in color palette or minor setting changes. But the game isn’t totally at fault despite these very evident shortcomings — a particular shortcoming (while I’m at it) that never really goes away, it pains me to report. While the control stick-rotating segments (the tunnel sections) are often rather simple to grasp, in brief periods they remain fairly enjoyable to simply watch as your humble ship soars through each and everyone of these sections at near-blistering pace during a track’s notable “bridge” section per se. Though ultimately more challenging to get fully right, especially when timing a quick rotate or shunt of the control stick in following where these blue-white lines of light follow. 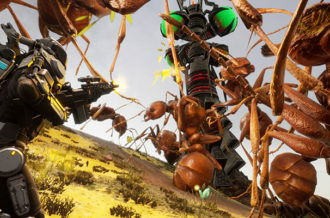 But it’s the shooting segments, particularly in one of the three “boss” levels — that require you to rein hellfire on a giant foe to deplete its health — that do at least manifest as the game’s arguably more difficult and thus most involving sections for the player to genuinely invest in. Outside of course the choice players eventually get in scaling up the difficulty upon gaining a high enough percentage on the previous mode, which is accomplished by gaining a high enough score and/or reducing the amount of lives lost on a run-through, if not losing any lives at all. On these terms, Aaero‘s objectives are relatively simple to grasp/understand and may well be deemed reasonable in the long-run, but notably carry with them a certain degree of tactile depth. 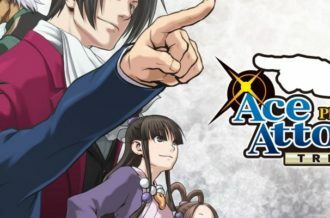 Especially with the ease at which players will eventually (after some early indecisiveness on figuring out the right time to fire one’s weapon at; bullets synchronizing to only hit their targets on a specified beat which can end up costly in the game’s more congested moments later on) get to grips with each track’s tempo/pacing and how this becomes critical when clearing away screens of enemies that take multiple hits to fully destroy — said foes often using bullet-fire to distract one’s focus and in one instance, an enemy type even generating a force-field that must be disabled first. Had this variety in enemy characteristics, outside of the way they move and the amount of bullets they can generate at one given moment (to bring to light the only real notable characteristics) been expanded on, the shooting segments — outside of boss “battles” — might not have felt as shallow or as under-baked as they end up being. More importantly, had these sections not be riddled with a similar plethora of game-breaking issues — your ship’s targeting reticle not locking onto certain enemies or hostile bullet-fire lying beyond the restricted diameter of your targeting range it’s near-impossible to avoid — not to mention some rather questionable design choices (the lock-on indicator being the same color as an enemy’s own bullet-fire) leaves a lot to be desired from the developer for what is essentially a very stripped-back on-rails perspective that lacks the same intriguing use of sound, like Thumper, or indeed the intrigue with which levels will evolve or transform right before you, as was the case with Rez. 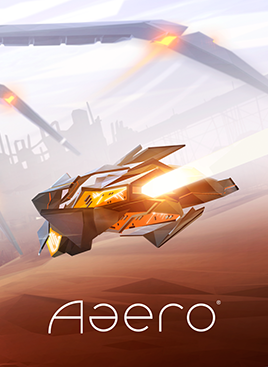 Aaero certainly keeps to its own chosen aesthetic with solid affirmation and it would be a lie to flat-out deny there’s but a quaint interest, much like its tunnel sections, to watch as your ship valiantly fly over stretched-out landscapes or [seemingly] derelict complexes. 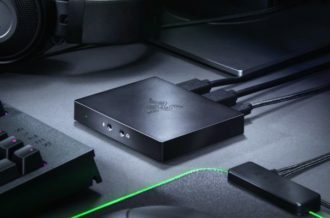 Especially when a slew of enemy ships fly onto screen — even combining at points into segments requiring you to guide your ship down these streams of light, forcing you into an interesting use of asynchronous movement of both analog sticks as well as one’s peripheral vision interestingly — ultimately requiring the utmost use of good timing and speedy reflexes (regardless if you’re the type to eye a full 100% completion). While Aaero’s challenge is enticing to tackle, the unfortunate string of performance and gameplay issues add detriment to the overall package. 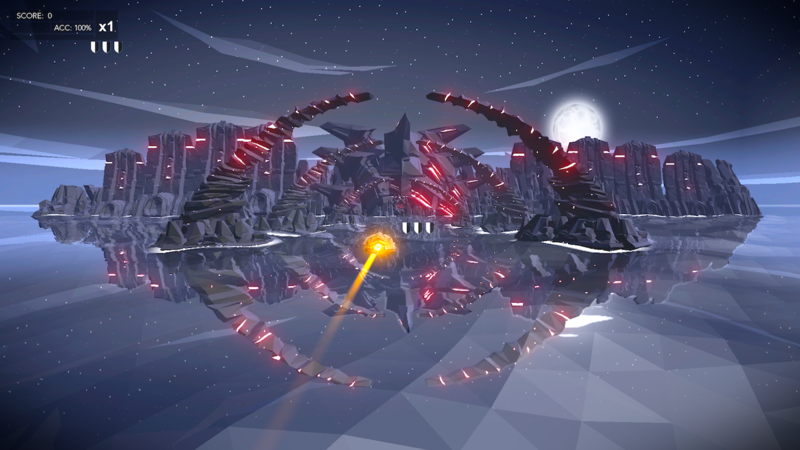 Outside of its confined choice of soundtrack and noticeably similar level design from beginning to end, enjoyable as it may be to rack up as high a score as possible and even push one’s self to higher difficulty modes thereafter, Aaero doesn’t quite demonstrate the same degree of intrigue or immediacy that past and even fellow contemporary efforts within this genre have so clearly shown. 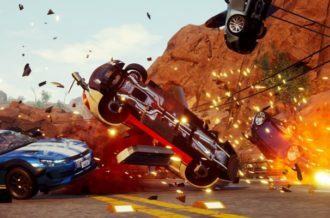 A few interesting mechanics here and there, the majority of the game’s run-time is spent retreading the same loop — perhaps worrying more so on when the next game-breaking hiccup will pop up next.